Deadline June 30th to respond to BW charity consultation! The DEFRA consultation on moving BW to charity status ends on 30 June. Please respond giving your views on whether BW is fit to become a charity. The responses will be considered when the Ministerial Order for the Statutory Transfer of BW to a charity goes through Parliament. It’s extremely important that all the issues get onto the table in the DEFRA consultation as there won’t be another consultation. It’s a longish read but both the impact assessment and the consultation proposals make no reference whatsoever to the people who live on boats on BW’s waterways. The Public Bodies Bill which will enable BW and other public bodies to be transferred, merged or abolished is currently going through Parliament. There is a shorter online response form for those who don’t wish to read the entire consultation document. The most important thing to know about the transfer to a charity is that BW has obtained an amendment to the Public Bodies Bill which will give it the power to make “subordinate legislation”. This means that BW will have greater powers to make law than now. Currently it has the power to pass Private Acts of Parliament and Byelaws. The Public Bodies Bill will give it the power to make Statutory Instruments as well. The procedure for passing Statutory Instruments requires very little Parliamentary or public scrutiny compared to Private Bills and Byelaws. Byelaws have to be consulted on and interested parties can petition against Private Bills and give evidence direct to the Parliamentary Select Committee which considers the Bill. In other words, BW will have greater enforcement powers if the Public Bodies Bill becomes law in its present form and BW successfully becomes a charity. The briefing below may be useful guidance to anyone responding to the consultation. It’s usually better to respond to consultations in your own words; responses that are exact duplicates may get counted as the same response. The National Bargee Travellers Association (NBTA) believes that British Waterways (BW) should not be transferred to charity status because of the routine and systematic harassment, threats of homelessness and actual evictions it directs at the adults and children who live on boats on its canals and rivers. This harassment is sanctioned by the Directors of BW but has no sound basis in law. If the landlord of a house treated their tenants in the same way they would be convicted of a criminal offence. This raises issues of Human Rights, specifically the violation of Articles 6, 8, and 14; Protocol 1 Article 1; Protocol 2 Article 1 and Protocol 3 Article 1 of the European Convention on Human Rights. The amendment to Schedule 5 of the Public Bodies Bill secured by BW, exempting the functions of the British Waterways Board from the provisions of Clause 22 falling within section 22(3)(b) to (e) means that BW will have the power to make “subordinate legislation”. This means that BW will have greater powers to make law than now. Currently BW has the power to promote Private Acts of Parliament and Byelaws. The Public Bodies Bill will give it the power to make Statutory Instruments as well. The procedure for passing Statutory Instruments requires very little Parliamentary or public scrutiny compared to Private Bills and Byelaws. Byelaws have to be consulted on and interested parties can petition against Private Bills and give evidence direct to the Parliamentary Select Committee which considers the Bill. We already have evidence that BW is seeking to increase its enforcement powers as part of the Public Bodies Bill. This was discussed under item 11/003 in the BW Board meeting on 27 January 2011. We do not consider that the amendments to the Public Bodies Bill agreed before 11 May 2011 relating to the use of Statutory Instruments will provide sufficient protection for boat dwellers against the violation of their Convention rights. The consequences of giving BW extra powers and removing the statutory protection for boat dwellers arising from the Human Rights Act, the 2010 Equality Act and the Freedom of Information Act that currently stem from BW’s status as a public body, will be the actual or threatened homelessness, removal from school and denial of access to employment, healthcare, postal mail and voting of up to 10,000 adult and child boat dwellers. The estimated 6000 to 10,000 boat dwellers who do not have moorings for their boats will be at risk, in spite of the intention of Parliament to protect these boat dwellers when it passed the 1995 British Waterways Act. Some 10% (3500) out of the total 35,000 BW licensed boats do not have moorings (information from BW). The majority of these boats are people’s homes. “(ii) the applicant for the relevant consent satisfies the Board that the vessel to which the application relates will be used bona fide for navigation throughout the period for which the consent is valid without remaining continuously in any one place for more than 14 days or such longer period as is reasonable in the circumstances” (Section 17 3 c ii). The intention of Parliament when it passed the 1995 British Waterways Act was to allow boat dwellers to continue to live on their boats without having a permanent mooring, in a way that enabled them to remain in employment; continue to send their children to school, and have protection from homelessness. BW had originally sought criminal sanctions against anyone caught living on their boat without a permanent mooring including a Level 5 fine (£1,000 at the time) and a daily penalty of 10% of Level 5 (£100). Parliament did not allow this and acted to protect the homes and livelihoods of boat dwellers (House of Commons Select Committee on the British Waterways Bill, 1993-94; British Waterways Bill, 1990). Consequently, the law allows boat dwellers to remain within reach of a place of work, their children’s school, a GP or other health care, and to collect their mail from a land address. They can also exercise their right to vote by declaring a local connection. In drafting the 1995 British Waterways Act, Parliament intended that the test for whether a boat was complying with Section 17 3 c ii was whether it had remained longer than 14 continuous days in the same place without good reason. The House of Commons Select Committee rejected any prohibition on returning to the same place within a specified period and declined to set any further requirements such as a minimum distance to be travelled. The 1995 Act and other relevant legislation do not specify any particular travelling pattern for boats without moorings apart from the “14 day rule”. (House of Commons Select Committee on the British Waterways Bill, 1993-94). Since 1995, BW has made many attempts to circumvent Section 17 3 c ii in order to terminate the licences of boat dwellers who do comply with Section 17 3 c ii in an attempt to achieve the original objectives that Parliament considered would be detrimental to the lives of individuals and families living on boats. BW has made successive attempts to force boats without moorings to follow travelling patterns which are substantially in excess of that required by the 1995 Act. For example it has done this by claiming that its own interpretation of Section 17 3 c ii (the Mooring Guidance for Continuous Cruisers) sets out what is required to comply with the 1995 Act. BW has the power to terminate a licence if it believes a boat has contravened Section 17 of the 1995 Act, and it also has the power to sieze an unlicensed boat and charge the owner for its removal under Section 8 of the 1983 British Waterways Act. When it does this it also obtains an injunction which effectively evicts the owner and the boat from BW waterways for life. In other words, termination of the boat licence means that the boat dweller and their family will become homeless, be forcibly deprived of their home and be banned from BW’s 2000 miles of waterways for ever. A number of boat dwellers have been made homeless in this way because they did not know enough about the law to defend themselves in court (Freedom of Information Act response from BW, 2010). Many other boat dwellers have been pressurised to rent moorings which they cannot legally live on because most moorings do not have residential planning permission. Some have “gone underground” following the threat of a Section 8 notice and injunction and live in fear of being discovered and losing their homes. The Mooring Guidance for Continuous Cruisers, published in 2004, states that boats without moorings must make a progressive journey throughout the entire canal system or a large part of it, without turning back unless they reach a terminus, and that acceptable reasons for remaining in one place do not include needing to have access to a place of employment or education. Adhering to the Guidance prevents boat dwellers from accessing their places of work, education and health care; from collecting mail and from exercising their right to vote. BW has attempted to enforce the Mooring Guidance for Continuous Cruisers by sending letters to thousands of boats over the past few years written in extremely threatening language claiming that not following the Guidance amounts to contravention of the law and saying “your boat has been seen between X and Y” (two distinct places which are many miles apart); “we may remove and demolish your boat”; “it is likely that you will need to make arrangements for alternative accommodation. Please contact your local Council’s Benefit and Housing department as they may be able to help you find another place to live” and “You are at risk of losing your boat”. Some 150 boats on the Kennet and Avon canal were served such letters in June 2009 for example. At the same time, since 1995 BW has declined to use its statutory powers to enforce the “14 day rule” either consistently or fairly. This leaves boat dwellers without moorings in a position where there are no consistent consequences for staying longer than 14 days and yet they are routinely threatened with homelessness for travelling in a way that Parliament intended them to be able to do. Since the publication of the Mooring Guidance for Continuous Cruisers there have been successive attempts to drive out boat dwellers without moorings by imposing additional restrictions. BW has worked with parish and county councils which object to the legitimate presence of lived-in boats on the canals to create restrictions on the amount of time boats without moorings can stay in particular areas (Minutes of meetings held in Bathampton on 15 June, 10 August, 28 August and 10 Sept 2009; Waterways and Public Involvement in Staffordshire 2011; Community Mooring Strategy Action Plan 2011). This led to a consultation in 2009 and the publication in 2010 of new mooring policies stating that boats without moorings would be subject to “Local Mooring Strategies” including restricting the amount of 14-day mooring space available; setting travelling distances and “no return within” restrictions substantially above and beyond those required by the 1995 Act; charging boaters daily fees of up to £14,000 per year to stay longer than the time limits, and enforcing these charges by not renewing the boat licence until the charges are paid. All of these restrictions are unlawful and are targeted against boats without moorings. BW is currently seeking to impose such restrictions on the Kennet and Avon canal; on the Lee and Stort navigations and in Staffordshire and is proposing to do so in many other locations (Policies for Mooring Along the Banks of BW Waterways 2010; Proposals for the Management of Moorings along the Rivers Lee & Stort, Hertford Union and Regents Canals 2011). The effect of these restrictions if complied with would be to force boat dwellers to travel distances that would prevent them from being able to travel to a place of employment; prevent them from sending their children to school; prevent them from accessing ongoing health care from a GP, clinic or hospital; prevent them from collecting mail from a land address, and prevent them from exercising their right to vote by making a declaration of local connection. If they wish to retain access to their workplace, school, health care, correspondence and right to vote, they will face homelessness following termination of the boat licence either for not complying with the restrictions or for being unable to pay excess mooring charges of up to £14,000 per year demanded at £40 per day. This is a punitive sum compared to the cost of a permanent mooring which is around £2000 per year and as such amounts to a fine even though it is called an “charge for an extended stay” in BW’s 2010 mooring policy. These restrictions are unlawful because BW does not have the power to set mooring restrictions, to erect signs delineating mooring restrictions, or to impose fines for the infringment of mooring restrictions. (House of Commons Select Committee on the British Waterways Bill, 1993-94). BW enjoys a “catch all” power under Section 43 of the 1962 Transport Act in relation to its management of the waterways. However it is reasonable to conclude that subsequent legislation modifies this “catch all” accordingly. Further, legislation that acts as an “override” (such as the Human Rights Act and the Equality Act) further qualify this “catch all”. As stated above, Parliament did not allow BW to impose criminal sanctions or daily fines against anyone caught living on their boat without a permanent mooring. In the original 1990 Bill BW had sought powers to impose fines for a breach of a mooring restriction. BW also sought powers in the 1990 Bill to post signs designating mooring restrictions. Parliament forbade BW to impose fines for violation of a mooring restriction. 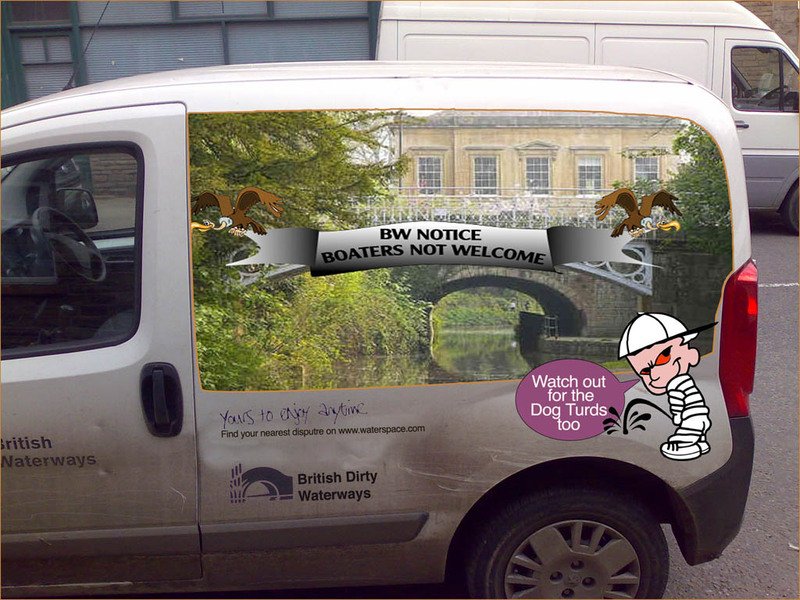 As a result of this, BW withdrew the wording relating to the posting of signs designating mooring restrictions. BW had previously presented evidence that stated that signs designating mooring restrictions were advisory in nature. BW also withdrew the wording relating to the designation of mooring restrictions. BW had also laid out in the 1990 Bill an offence for failing to obey an instruction of a BW officer which was also denied by Parliament. The Commons Select Committee also rejected any “no return within” restrictions (House of Commons Select Committee on the British Waterways Bill, 1993-94). As a consequence this meant that BW was confirming that any mooring restriction would remain as “advisory” and not “obligatory”. A further principle in law is that legislation is written in “living words” and the meaning of the words does not change with changing circumstances. The current legislation is binding and must be interpreted in the courts in line with the original meaning of the words and the original Will of Parliament. These factors combine to provide an override over Section 43 of the 1962 Transport Act so as to prevent BW from designating compulsory mooring restrictions and from setting movement rules beyond what is in Section 17 3 c ii of the 1995 Act (the “14 day rule”). In this context the authority given in McCarthy & Stone (Developments) Ltd v Richmond upon Thames LBC  UKHL 4 in which reference is also made to the authority given in Attorney-General v Wilts United Dairies Limited  38 TLR 781 (HL) further underlines the principle that a public body such as BW may not make a charge unless there is express authorisation in statute to do so. Furthermore, in R v Secretary of State for the Environment and others, ex parte Greenpeace Ltd and anr  4 All ER 352, Potts J stated: “Primary legislation is not to be construed by reference to general policy statements or departmental guidance”. In other words, primary legislation stands on its own two feet. Where guidance or policy statements are used to justify the interpretation of legislation by a public body so that the public body may achieve its objective, that public body is inherently going beyond the scope of the primary legislation and is acting ultra vires. In 2010 took action against Paul Davies in Bristol County Court on the grounds that he had not complied with section 17 3 c ii. The judgement stated that Mr Davies’ cruising distance was not enough to comply but declined to endorse BW’s Mooring Guidance for Continuous Cruisers. The court did not hear evidence regarding the House of Commons Select Committee deliberations in 1993-94 because this information was not available to Mr Davies at the time. Despite the judgement being in a county court and consequently not forming case law, BW issued a press release misleading the public into believing that this judgement set a precedent which would apply to other boaters without moorings. It has subsequently sent letters to a number of boats without moorings enclosing this press release, claiming that the judgement applies and that they are contravening the law even though they do move to a different place every 14 days. In another case in Bristol, BW is attempting to seize a boat and remove the owner George Ward from its waterways for non-payment of a debt of £150. Tenants of houses are explicitly protected from eviction for debts of this size. In Cheshire in 2010, BW forced sick pensioners and their carers to move their boats in freezing conditions with the result that one of them had to be rushed to hospital the following day. BW has also issued patrol notices requiring boats to move when they have been prevented from travelling by thick ice. Paul Davies himself has been forced to give up his job and leave BW waterways. He was unable to meet the court’s requirement to comply by taking a mooring because no residential moorings were available. At the 2010 BW AGM an attendee asked why the draft objectives of the new waterways charity made no mention of the thousands of adults and children who live on boats for whom the waterways are their home. Robin Evans, BW Chief Executive said in response “It’s questionable that giving people places to live is a charitable object”. BW is clearly not fit to have charitable status; over 1000 Housing Associations have charitable status yet Mr Evans is unaware of this. During 2009 and 2010 BW drafted revised byelaws which include many of the provisions which Parliament prevented it from including in the 1995 Act. These byelaws have been put on hold pending the move to charity status (Revised Draft Byelaws 2010). If BW is given the power to pass Statutory Instruments there is no doubt that it will use those powers to achieve its 1990 objectives of driving out boat dwellers without moorings which Parliament would not allow it to do in 1995. The homelessness and displacement resulting from this would be unthinkable at a time when the EU has just announced a strategy to integrate Europe’s 11 million Gypsies and Travellers and the UK has been given until the end of 2011 to draw up a national plan to ensure that every homeless Traveller has access to suitable accommodation. ● Legal recognition of the homes of boat dwellers on a par with that enjoyed by house dwellers. ● Statutory protection of boat dwellers from harassment and unlawful eviction of the same magnitude as the protection enjoyed by house dwellers, applicable to all boat dwellers on inland and coastal waters, whether or not they have a permanent mooring. ● Clarification that the test for compliance with Section 17 3 c ii of the 1995 British Waterways Act is as intended by Parliament, namely, whether the boat has remained in one place for longer than 14 days without good reason. ● Explicit recognition of boat dwellers without permanent moorings are classed as travellers for the purposes of Section 225 of the 2004 Housing Act; the 2010 Equality Act; the Human Rights Act and the EU requirement placed on the UK to draw up a national plan in 2011 to ensure that every homeless traveller has access to suitable accommodation. ● Security of tenure for mooring holders on a par with that enjoyed by the tenants of houses. This entry was posted on Sunday, June 12th, 2011 at 6:11 pm	and is filed under A-Featured Articles, BW Policy News and FOI Act Requests, Continuous Cruisers, News, Resources, The Law. You can follow any responses to this entry through the RSS 2.0 feed. You can leave a response, or trackback from your own site. ““(ii) the applicant for the relevant consent satisfies the Board that the vessel to which the application relates will be used bona fide for navigation throughout the period for which the consent is valid without remaining continuously in any one place for more than 14 days or such longer period as is reasonable in the circumstances” (Section 17 3 c ii). Why did it talk about bona fide continuous navigation and the 14 day rule, then? Surely if it intended people to be able to live in one place it would not have introduced these rules? As a GENUINE continuous cruiser I think that security of tenure is a terrible idea. I hope that the new charity cracks down on licence dodgers and enforces the rules that benefit the wider community of waterway users. In your bitter little rant you appear to have missed the non-sequiter introduced in your sentence. Any discussion of bona fide for navigation has nothing to do with licence evasion. I am not aware of anyone who believes it a good idea to not have a licence, indeed this is the basis of our stake holding. As for your other, ill thought out, comment, you appear to be confusing a number if things considered in parliament; firstly what BW asked for was considered draconian so checks and balances were introduced, eg “except as is reasonable in the circumstances”. Second, there is no definition of ‘bona fide” so for you to choose your own narrow definition to suit your prejudice is at best disingenuous. Parliament intended to enable boat dwellers to continue to remain in employment, send their children to school etc and that is why Section 17 3 c ii is worded in the way it is. The 14 day rule is consistent with this. The test for whether or not a boat is being used bona fide for navigation as intended by Parliament is “has the boat remained MORE than 14 continuous days in the same place without a good reason?” If so, it is not being used bona fide for navigation and if this is a persistent pattern, rather than a one-off event, the licence renewal may be refused. The “continuous” refers to the length of stay, not to the length of the journey. There was no intention to prohibit boats from returning to the same place for any specific period. “Place” was not defined but a reasonable definition would be a different suburb, town or village rather than just a different mooring spot a few metres away. Parliament considered many possible reasons why a longer stay, agreed with BW, would be acceptable. In 2004 BW introduced a completely different test for whether a boat was being used bona fide for navigation which was “Is the boat on a progressive journey around the entire canal system?”. This is way above and beyond what Parliament intended when it drafted the 1995 Act. Look up the Select Committee Minutes for the Act if you want to know more. Great picture? Childish, petulant and stupid are the words that come to mind. The waterways are not some kind of council housing estate. The 14 day rules – and the requirement to PAY for a licence are well established. Those who can’t or won’t obey the rule should stay away beacuse, quite simply, the waterways aren’t viable for them. Once again a nasty little rant confusing the discussion about bona fide for navigation with licence evasion. You really need to engage your brain before spitting out your small minded bile.